Tea and cake are such good friends, they make for a time of peaceful indulgence. I couldn’t help follow-up the last post on tea with this one on my favourite cake recipe. The most versatile recipe, ever! The Best Two Egg Cake recipe is the most versatile cake recipe I have come across since I learnt how to bake. I am not a great baker and I almost always get great results using this formula. Each of these cakes, one the blog, was baked by adapting the Best Two Egg Cake recipe. 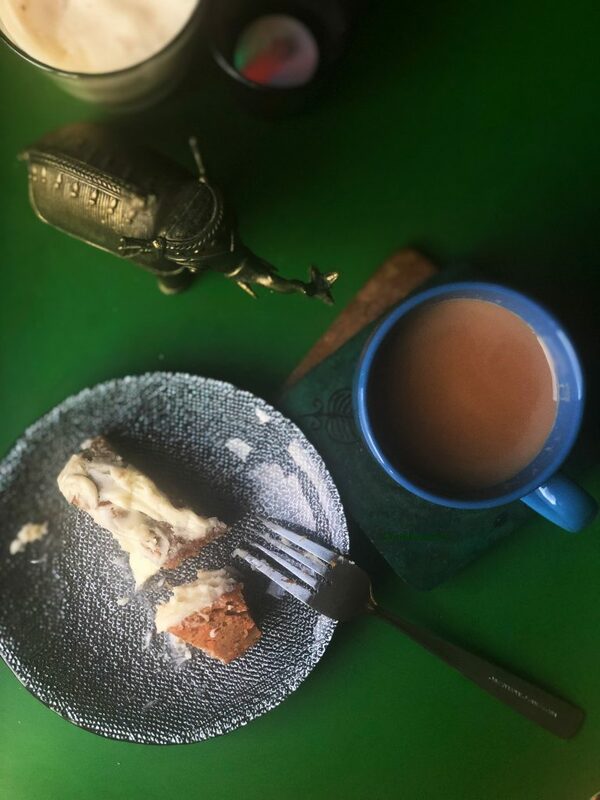 Rum Soaked Carrot Cake – eating it up! 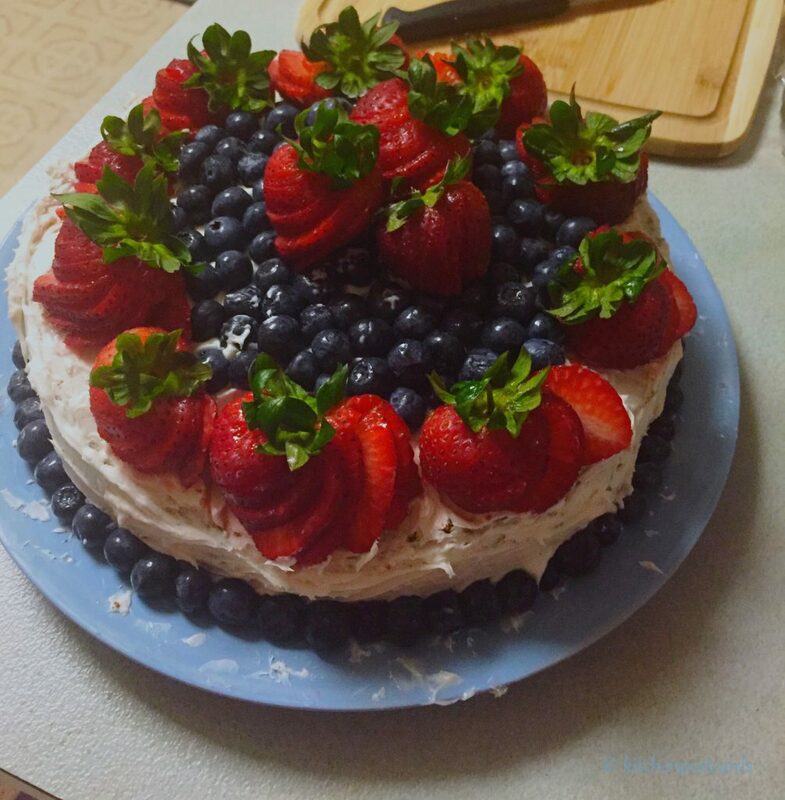 Berry Berry Birthday Cake -Let’s get the candles! 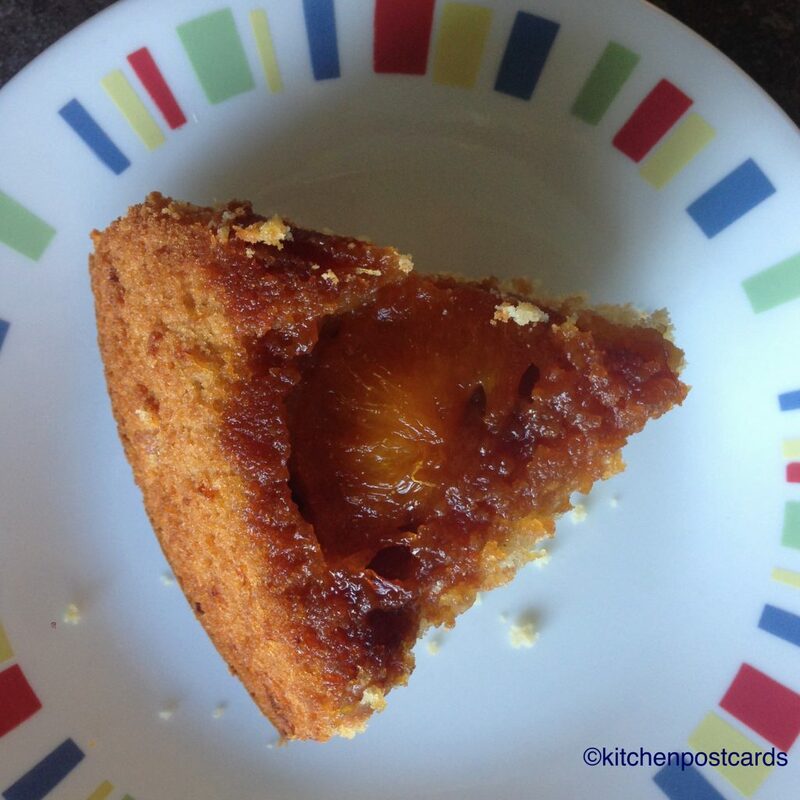 Upside Down Apple Mandarin Cake – Enjoy! This recipe has been passed down to me from my mother who got it from a collection of recipes that her father had hand written on his notepad a few decades ago. He spent a few years in Germany doing his doctorate, so I have often wondered if he wrote down this particular one from a book he found there. My grandmother does posses some wonderful books on baking which she acquired in Germany. So in the tradition of handing down information, which in magical cyclical ways travels around the world, here is the best two egg cake recipe with my modifications and suggestions. 1/2 cup shortening: I use regular cooking oil, canola or even olive oil. 1 1/2 cups sugar: brown or white, both work well. No need to use powdered sugar, granulated sugar dissolves wonderfully. 1 to 2 teaspoons vanilla, depending on how much you like the taste of vanilla or detest the smell of egg! 2 1/4 cups sifted cake flour. I sometimes mix this up with whole wheat flour. So I use 2 cups of regular flour (maida in India) and 1/4th cup of whole wheat flour or atta. 2 1/2 teaspoons baking powder, add more if you are using whole wheat flour. 3 teaspoons will suffice. Preheat the oven to 375 degrees. Always do this first otherwise you’ll end up waiting for the oven to heat while your batter sits and looses some of its airiness. Sift all the dry ingredients together ie the flour, salt and baking powder in a bowl or a flat dish like a parath (Indian flat plate with raised edges, commonly used for kneading flour). In a mixing bowl, first measure the oil/butter/ shortening, whichever you are using. To this add the sugar and mix well. Now in the same bowl break in the eggs, one at a time and beat each of them well until it combines with the oil and sugar. Once you are done with the eggs add the vanilla essence and mix well. To this mixture alternately add the dry ingredients and the milk, mixing well each time. Finish with milk and make sure there are no lumps in the batter. I mix using a whisk or a sturdy fork. But if you have a beater, that is the best way to go about it. Do not over do, you might end up with a very flat batter, the cake will not rise. Note: I usually add flavouring at this point. If you want to make it into a chocolate cake, keep some of the milk to help combine cocoa powder with the batter. Make this your last step. There is no fixed quantity for the amount of cocoa required. Not a chocolate fan? 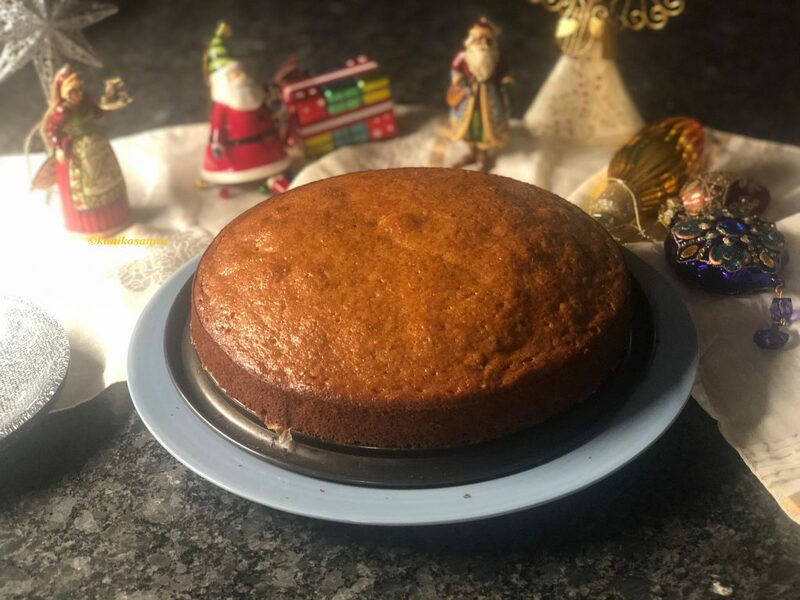 No problem, throw in some ground spices like cinnamon and nutmeg and make this a warm, nutty flavoured cake for the winter months. You might even want to throw in some walnuts. Versatility is this recipe’s middle name! By this time the oven will be ready. Lightly oil your pan or line it with butter paper, I use a 9″ diameter round pan with a 2″ height. This holds the entire batter. but if you have smaller pans, divide the batter. You can also use it to make cup cakes. Once the batter is in the pan, put it in the oven. Make sure the rack is equidistant from the top and bottom heating elements. You don’t want the cake to burn at either end. The cake will take between 25 minutes to half an hour. Check with a knife or a toothpick, poke it in the center of the cake right up to the bottom. If the knife or toothpick comes out clean then the cake is ready. If not keep it in the oven with 10 minute increments and be sure to check every 10 minutes for doneness. Once done, cool before slicing.